Literacy Beyond Text Comprehension aims to systematically investigate how readers interpret reading tasks within a situation, and how that interpretation influences reading behavior and comprehension. Presenting a new model of REading as problem SOLVing (RESOLV), the authors describe reading comprehension in terms of how a reader adopts goals within a particular situation that then guide what is read, when, and how. By applying the RESOLV model to a range of reading situations, this book provides evidence to suggest that there is no unitary understanding of a task, because individuals bring their own goals and characteristics to the situation; as such, it demonstrates the importance of understanding how a reader (e.g., student, test-taker, employee completing a work task) represents the context and the specific assignment. 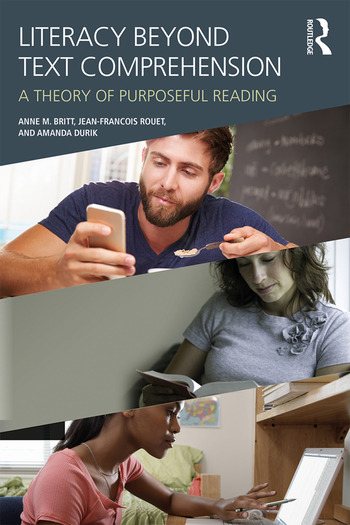 Written by internationally recognized learning sciences scholars, Literacy Beyond Text Comprehension advances the state of the art in reading research, but also seeks to inform a broader range of audiences, including those interested in the teaching and the assessment of reading. 1.1. Adaptive reading behavior assumption. 1.2. Limited processing resources assumption. 1.3. Feeling of knowing evaluation (FOKE) assumption. 2.2.2.1. Reading self-concept and reader dispositions toward reading. 2.2.2.2. Task schemata and the construction of a Task Model. 2.2.2.3. Reading skill, vocabulary and knowledge of text organizers. 2.3.2.1. Elements of a Task Model. 2.3.2.2. Task and product schemata. 3.1. Situation 2. "What is a carbon store?" 2.2.1. Do I need external information? 2.2.1.2. A "Yes" decision will be more likely. 2.2.1.3. A "No" decision will be more likely. 2.2.2. Is current information goal-relevant? 2.2.2.2. A "Yes" decision will be more likely. 2.2.2.3. A "No" decision will be more likely. 2.2.3. Is the goal satisfied? 2.2.3.2. A "Yes" decision will be more likely. 2.2.3.3. A "No" decision will be more likely. 1.1. When do readers really start reading? 1.2. What guides readers through a text? 1.3. What do readers need to know in order to make good reading decisions? 1.4. How is all this specific to reading? M. Anne Britt is Professor in the Department of Psychology at Northern Illinois University, USA. Jean-François Rouet is Director of Research at the French National Center for Scientific Research, France. Amanda M. Durik is Associate Professor in the Department of Psychology at Northern Illinois University, USA.